Ann Froman continues to excite the art world with her emotionally powerful sculptures. Internationally recognized for her work in bronze and acrylic, she has bridged the gap between museum masterpieces and timeless works of art for the home. Froman’s incredible career spans over 42-years, from her time as an award winning fashion designer to her rise in the art world, where she has earned the reputation as one of our greatest living sculptors. Her work is powerful, engaging, innovative and inspirational – a reflection of the artist . Froman walked away from a successful career as an award-winning fashion & shoe designer, to become a sculptor. A native New Yorker, Froman’s studies took her from the Fashion Institute of Technology, NYC, to the National Academy School of Fine Art, NYC, and on to the Palace of Fontainebleau School of Fine Arts in France, where she became a protégé of Le Corbusier and studied Painting with Henri Goetz. Today she is best described as a multi-faceted “Renaissance Woman,” enjoying worldwide notoriety. One of her first bronze series, the famed Women of the Bible, was noted as, “A great cultural contribution to the arts, “ by the Dade County Florida Council of the Arts and Sciences during its national tour. Froman’s Dancing Bronzes collection was created for the Bennington Museum in Vermont. Famed choreographer June Taylor, commented, “Froman’s dancers come alive, possessing a timeless quality, an outstanding tribute to the dance.” These bronzes are in the collections of many prominent dancers, including: Alvin Ailey, Dame Margot Fonteyn, Rudolph Nureyev and Ann Miller. After experiencing an abusive marriage, Froman created Portrait of a Family… Broken Dreams, a great masterpiece that pays tribute to life’s passions, and shows how the traditional family portrait has changed. The provocative images she creates have become the signature of her success as a sculptor, artist. Froman’s timeless bronze masterpiece, Survival, pays tribute to Raoul Wallenberg, the Swedish Hero who saved 100,000 Jews and Christians during the Holocaust. This powerful piece was purchased by Time Warner, Inc. for Radcliffe College in Cambridge, MA; it is also prominently displayed on the campus of Brooklyn College and Harvard University. 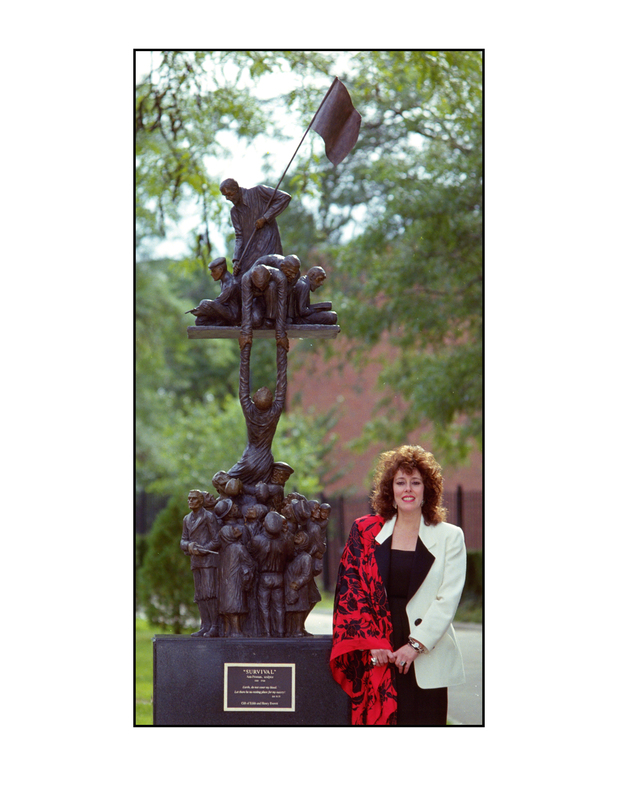 On the darkest day in America’s recent history, Ann Froman felt compelled to create the masterpiece known today as Heroes of 9/11. Two moments are joined within this bronze and acrylic memorial: the acknowledgment of this unthinkable tragedy, and the ability to rise above it and look to the future. Heroes of 9/11 pays tribute to all our beloved heroes, and depicts the unity and courage displayed by firefighters, police, civilians and co-workers rescuing their fellow man. The recipient of many awards for contributions to modern sculpture, Ms. Froman’s works can be found in the permanent collections of: Brooklyn College, NY; Harvard University, Boston, MA; Metropolitan Museum, NY; Springfield Museum of Fine Arts, MA; Butler American Institute of Art, Youngstown, OH; Temple Emanuel, NYC; St. Raphael’s Church, Livingston, NJ; The Jewish Museum of Greater Phoenix, AZ; New York Hospital of Special Surgery, NYC; Florida Holocaust Museum, St Petersburg Fl, Culinary Institute of America, Hyde Park, NY, and among many private, national and international collections. Ann Froman continues to push the envelopes of her creativity in order to educate the public through her artistic expression. My daughter Pamela Froman’s flattering post on her blog!